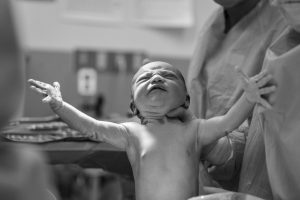 Moira’s Marvelous Birth with Hypnobabies! I had period-like cramps at night for a few days, so I knew it was close, but at the same time I had gotten used to feeling them. After spending a week or so telling my husband that most women’s waters don’t break until well into the birthing time, mine broke! It wasn’t a huge amount, but enough that I had to wear a pad and change it every hour. I called out doula to let her know and she told me to try and get as much rest as possible. I made a playlist of Easy First Stage, Deepening , and Birthing Day Affirmations and went to bed. Around 2am I was having trouble sleeping through waves that were about 15 minutes apart. By 6am my husband was timing them at 3-4 minutes apart. I remember looking at him and saying “but they aren’t that long” and he smiled and said “if you say so”. He called our midwife’s office and when she returned his call she encouraged us to have the doula come to our house. (She was concerned that the broken water would put me on the clock at the hospital. . . and I sounded so calm.) I took a shower and then laid of the couch for a few minutes and slept between waves. At one point, I just sat up and said “we have to go”. DH called the doula and told her to meet us at the hospital instead! I have to say earlier on I kept trying to turn my light switch off during pressure waves. At this point I was so uncomfortable staying still that I went to center and rocked mostly on the back of DH’s swivel office chair of all things! I HATED sitting on the birthing ball that used almost everyday! When we got to the hospital, we went through the same stupid stuff everyone complains about. The stupid questions! Hospital policy requires that moms are hooked up to monitors for at least 20 minutes before they can go to a room. I’m a person who normally can’t sit still, so this was like torture! Another nurse came in and asked me more questions that I had already answered. I literally ignored her during waves and answered her when I felt like it. (Although both DH and the doula were there and they could’ve easily answered the stupid questions! grrr) I did learn at this point that 1) my midwife was the one there from her practice and 2) the birth center (reserved for natural births) was open and ready! YEAH! 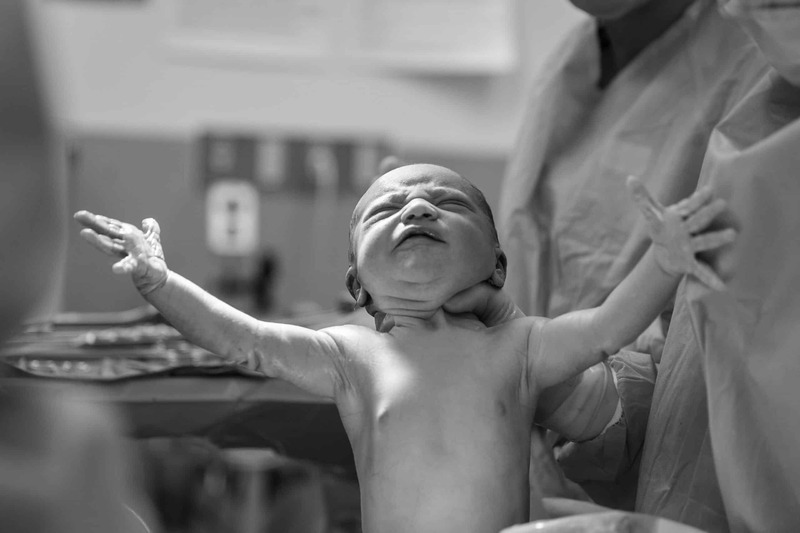 My midwife came down and checked me and seemed surprised and wanted me to get to the room. (I didn’t hear her then, but I was 8cms!) As soon as they released me from the monitors, I insisted on going to the bathroom AND walking- though they wouldn’t let me take the stairs! As soon as I got into the room I got in the tub. Another reason I love my midwife- moms aren’t allowed in the tub if they’ve broken waters! Hehe! I spent a good amount of time in that tub! I started to feel sick, so I got out, sat on the toilet, and the birthing stool. I felt very pushy, but didn’t really know what to do. My midwife and doula talked to me about pushing and how I could do it. I listened to them, because I couldn’t really find a rhythm that worked for me. But I felt like it was on my terms. I was also listening to Pushing Baby Out out loud and everyone loved it! I couldn’t find a comfortable position, so they suggested that my husband sit on the bed behind me. I think this really ended up making the experience for both of us! After getting a rhythm for pushing the midwife asked if I wanted to feel her head! I reached down and remember thinking she had less hair than I thought she would! I pushed for a bit longer and the MW explained that when her head got to a certain point, I would have to slow down so she could check for the cord. Within a few pushes, the nurse couldn’t get her heartbeat (she was so low!) and the MW told me that I had to get her out soon. The whole thing about slowing down totally went out of my mind and I pushed her out in one big push! The cord was around her neck, but the midwife got if off and put her right on my chest and she immediately wanted to eat! My husband was crying and telling me what an amazing job I did. It was one of the best moments of my life! Looking back I have no idea how I laid there and literally joked with the OB about the fact that I wanted to get a pedicure before the baby was born and apologizing about my chipped nail polish! I had the Deepening track on with one headphone in, in center and my husband was holding Moria in a chair next to me. The funniest thing was that the OB had come into the birth center and saw me on the queen sized bed before he requested the regular bed with stirrups. (He was an older guy; I can’t blame him for not wanting to lay on the bed while stitching!) While he was working he asked my midwife, “How do you deliver like that?” She laughed and said “everyone’s in the bed and everyone is comfortable.” I love it! ANYONE who is having doubts, seriously Hypnobabies helped me so much! Up until a few days before, I was still unsure. I did a fear release about pain and if I’d be able to handle it. Here’s the thing, there wasn’t any! I’ve heard about how terrible back labor can be, and I didn’t feel anything that I couldn’t handle. Everyone was talking about my pain tolerance and how I was smiling at them. I’m a serious wimp when it comes to the dentist, so I don’t think that I have a particularly high pain tolerance. I just kept thinking about holding little Moira and made it happen. What an empowering experience! A final note about husbands. . . mine was amazing. I couldn’t take it seriously when he read scripts to me, so we never did that. He learned the cues and used them perfectly! I remember him touching my arm and saying “relax” and instantly relaxing, not realizing I had been tense. I don’t even know if he ever listened to the Birth partner CD.